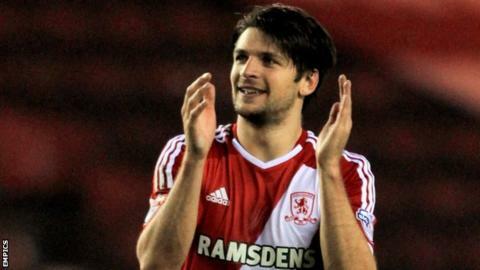 Defender George Friend says Middlesbrough must "enjoy" their status at the top end of the Championship and relish the challenge of staying there. Aitor Karanka's Boro lie third on the back of a five-match unbeaten run and have won nine of their 18 league games so far this season, losing four. "You've got to enjoy being up here," Friend told BBC Tees. "We have to take pride, and have that bit of confidence knowing that we deserve to be there." Saturday's 1-1 draw at Wigan Athletic saw Karanka's side come back from a goal down to level away from home and maintain their promotion bid. Blackburn provide the opposition on Saturday as Boro bid to extend their six-match unbeaten home streak. "The manager cannot stress enough it's one game at a time and he drills that into us," Friend added. "We do just look at the next game but it is better to be there rather than 10 places or 20 places down the table."